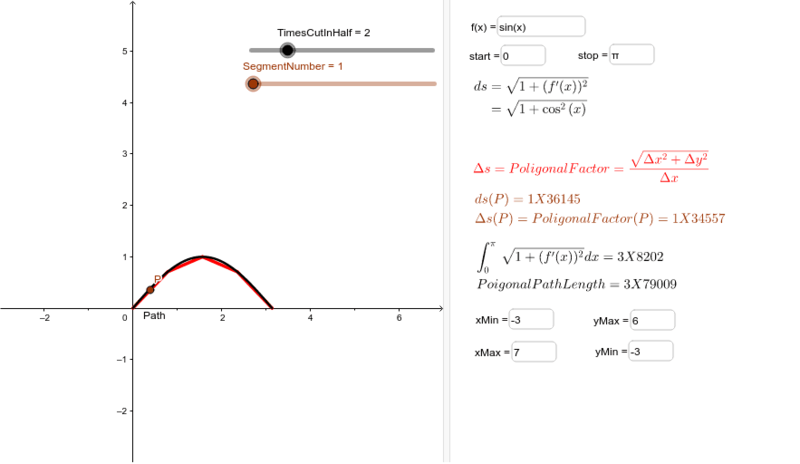 This applet is designed to let you explore arclength of the graph of a function. A curve y=f(x) is given and compared to the polygonal path obtained by cutting the x interval in half a number of times and connecting points on the curve by straight lines. ds is the normal integration factor evaluated at the midpoints of the straight lines. is the ratio of each straight line to its base. If you cut the interval in half 10 times, there are over 1000 subintervals and the approximation is very good. As always, when exploring with a new method, start with a curve whose length you know. That is easy to do with a straight line where f(x)= ax. You can then look at arbitrary functions. See how many subdivisions you need to make for the polygonal length to be within 1, 2, or 3 decimal places of the integral answer. See how widely ds varies in the interval.